Home » Cleveland , collection , commanders. , cruiser , dasha perova , gameplay , missions , news , William Halsey , world of warships » World of Warships - Update 0.7.5 Collection - Campaign "Hit Hard! Hit Fast! Hit Often!" World of Warships - Update 0.7.5 Collection - Campaign "Hit Hard! Hit Fast! Hit Often!" Update 0.7.5 is not all about ships. We'll offer a new themed campaign and a collection that will be available in the game on a permanent basis. Campaign "Hit Hard! Hit Fast! Hit Often!" The story of the campaign will tell about the military career of the U.S. Admiral William Halsey. To complete it, you'll need ships of Tier VIII or above while some tasks will require U.S. ships of select types only. By completing tasks, you get a variety of useful rewards, including super containers given for accomplishing final tasks. 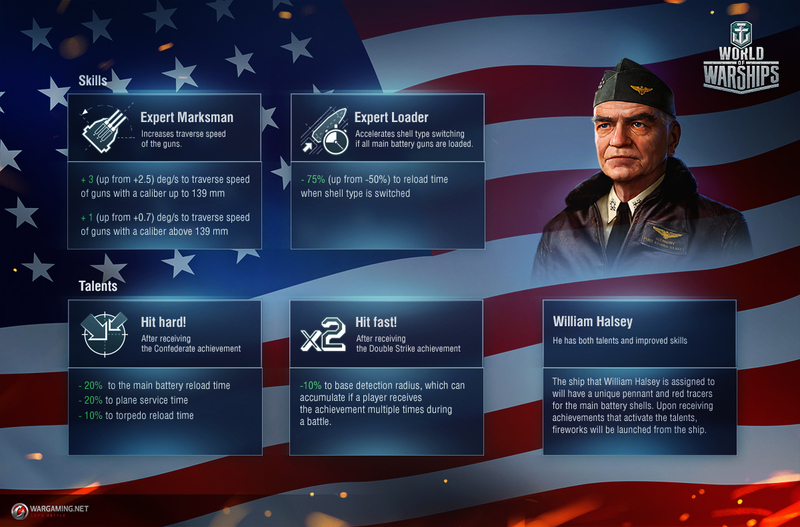 Once you are through with the last task of the final mission, you get a unique commander called William Halsey with 15 skill points, talents and a commemorative patch. -75% (intead of -50%) to the reload time of guns when switching shell type. +3 deg/s (instead of 2.5 deg/s) to the traverse speed of guns with a caliber up to and including 139 mm. +1 deg/s (instead of 0.7 deg/s) to the traverse speed of guns with a caliber above 139 mm. -20% to the main battery loading time. -20% to the service time of carrier aircraft. -10% to the reload time of torpedo tubes. -10% to standard detectability (the value stacks if the "Double Strike" achievement is earned several times in a battle). Medals of merit issued by the U.S. Navy like Medal of Honor or Silver Star Medal. Patches (as collection items) such as machine gunner or radar operator patches. Completing the subcollections will allow you access to a set of alternative color patterns for standard expendable and permanent camouflages for U.S. ships, as well an ability to fly a second flag on them. Each of the sub-collections will be dedicated to one type of ships only. You can build your collection as long as you are "subscribed" for it, i.e. if the "Collect" button is activated on the collection screen. Should you decide to continue with a different permanent collection, your progress under the "American Cruisers" collection will be suspended until you press the above-mentioned button again. If the "Collect" option is enabled for this collection, collectible items will come in daily containers. The US frenzy is by no means over at this point as next we’ll be launching the first part of a marathon of combat missions with the ultimate reward being the Tier VII Premium cruiser Indianapolis. The majority of "American" containers will primarily be available as a reward for the successful completion of the marathon missions. In addition to the expendable "Stars 'n Stripes" camo, special and economic signals, they may contain combat missions which, once completed successfully, will bring Premium ships ranging from Sims and Monaghan to Atlanta and Kidd right into your Ports. The refitted researchable Cleveland and a corresponding commemorative patch can also be obtained that way. Each of the missions can drop out for you only once. If you already have any of the above-mentioned ships, you'll get a Commander slot and a bonus in credits. Please note that the combat missions for those ships will only be available in the period from June 1 till August 20, 2018. More details about the conditions of the marathon will be available in an article on June combat missions.